When you enable this new option (click on the expand button in the top right), the compose window will become centered in your inbox, expanded to fit on your screen, and the formatting toolbar will be turned on by default. Furthermore, and even more importantly, you set full-screen as the default by selecting “Default to full-screen” in the more options menu at the bottom-right. If you don’t use Gmail, this probably doesn’t seem like a big deal to you. For those that do, however, the new compose window for the email service has been a big source of frustration, and this tweak is meant to alleviate that a bit. The feature was first launched in October 2012 and Google has been trying to improve it ever since, usually in response to user feedback. 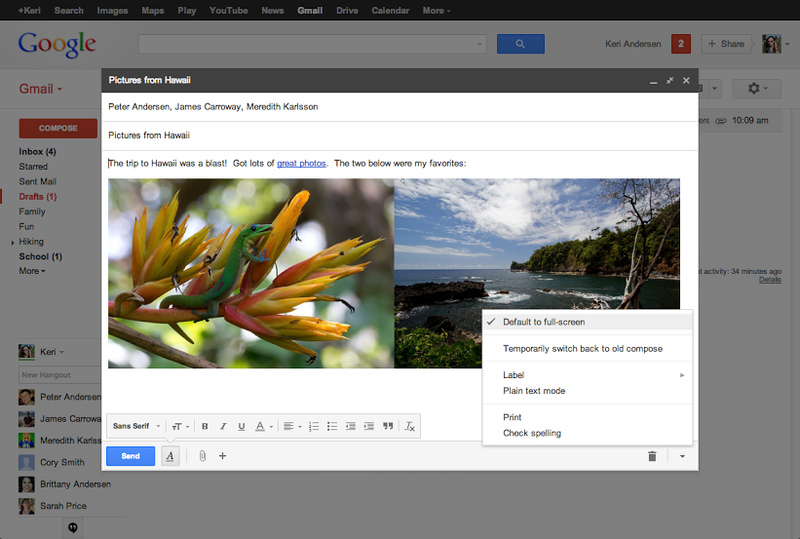 Google’s main argument for the new design was that it let you reference your inbox while writing a new email, but many argued this was more distracting than useful. With this change, Google is throwing its hands in the air and admitting that not everyone likes the new compose window, and some simply want it to work like before. Others of course prefer the change, and so the company is relenting by offering a new option, as opposed to reverting to the old way.